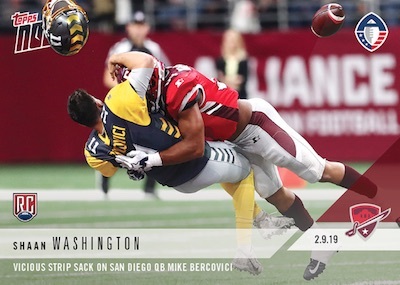 While the league and teams are new, fans and collectors are sure to recognize some of the players featured on 2019 Topps Now AAF Alliance of American Football cards. The print-to-order set identifies key moments and performances from the new professional football league that includes eight teams. Selling for $7.99 per card in week two after starting at $9.99 in week one, the pricing is lower than the other Topps Now offerings. However, the execution is similar, with recent AAF events highlighted on cards that are sold online at Topps for just 24 hours. Collectors can elect to buy bundles to decrease the per-card cost. And, as always, free SmartPost shipping is included in the main price. View available Topps Now AAF cards on the Topps site. 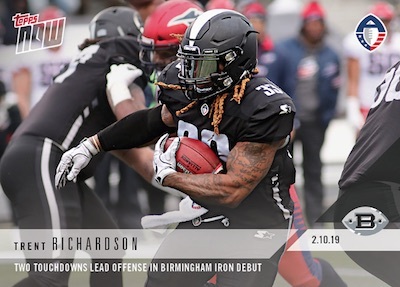 The 2019 Topps Now AAF Alliance of American Football checklist begins with the inaugural opening weekend of games starting on February 9. It should continue throughout the 10-week regular season, four-team playoff and AAF title game. The championship matchup is planned for April 27. In addition to the on-demand format, Topps also has a standard 2019 Topps AAF Alliance of American Football set. Buy earlier 2019 Topps Now AAF cards on eBay. Shaan Washington 2019 Topps NOW AAF #4 San Antonio Commanders RC Just 736 Made! 2019 TOPPS ALLIANCE OF AMERICAN FOOTBALL HOBBY SEALED BOX - PRE-ORDER!